One week to go for the season. 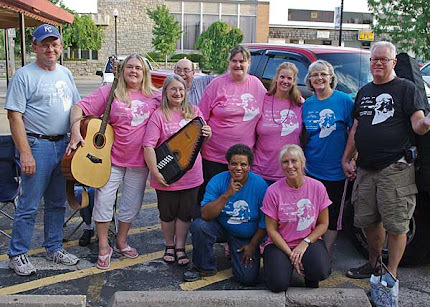 Next Monday night, August 30, will be the last Pickin' on the Patio for 2010. Theresa has given us all the assignment of only happy uplifting songs for the final week of this, our seventh season. I guess that means no "Eve of Distruction," or other songs about murder and mahem. She would probably even censor, "I'll Never Get Out of This World Alive, " and "Mama Tried." This will be a smiley week! The weather was great last night and I am sure that the 30th will be even better. If all goes well, the Lord is willing, and the creek don't rise, the next Pickin' on the Patio will be June 6, 2011. It has been a good season for Pickin' on the Patio with good attendance every Monday night. There are just two weeks to go before we close for the season, so come and join the fun. We still have Pickin' on the Patio T-shirts, so get yours soon. We will also have them on sale this Saturday night when Sky Blue will be playing a two hour concert at Homer's. 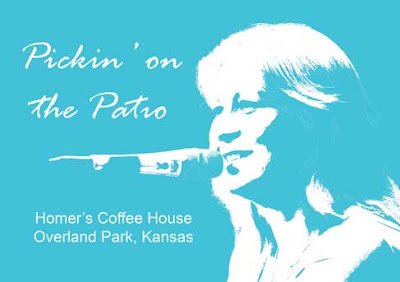 Pickin' on the Patio T-shirts are here! We have a selection of colors and sizes. Theresa's smiling face is on the front and the back says, "Pickin' Til Dark," with the web address. The price is $15. You can get them any Monday night at Homer's or call Jim at 913 269-6709, Jim@SkyBlueBand.net, and we will get one to you. Pick up your shirt on the 9th and then wear it on the 16th and we will get a group photo. You people are amazing! On one of the hottest nights of the year, the parking lot was full of people to hear the dozen or so musicans who came to share their talents. We had some great singers and players as well, and as the temperature on the bank clock across the street slowly slid back to double digits from the low 100's, those of who came to play or just listen, enjoyed the slight breeze. Overall, one of the best nights yet in spite of the high temperatures. Four more weeks to go for the season. Pickin on the Patio T-shirts should be here next week. They are $15 with Theresa's picture on the front and "Pickin' til Dark" on the back.